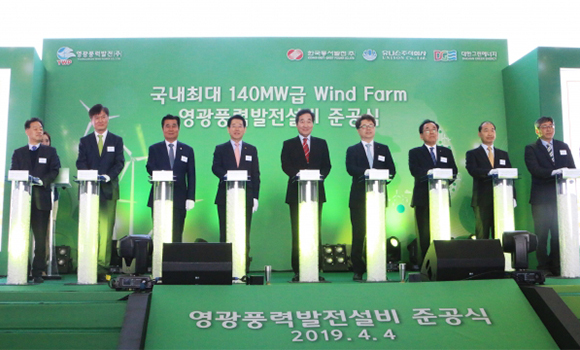 Korea East-West Power Co., a fully-owned subsidiary of state-run power utility Korea Electric Power Corp., on Thursday opened the country’s largest 140-megawatt (MW) wind farm along the west coast in South Jeolla Province. The country’s biggest wind farm is completed after Korea East-West Power recently finished the construction of the third-stage 79.6-megawatt wind power plant, adding to the first two facilities with each 20-megawatt and 40-megawatt capacity completed in February 2014 and May 2015. A ceremony marking the completion of the wind power complex was held in Yeonggwang in South Jeolla Province on Thursday. The wind farm is capable of producing 260,000 megawatt-hour electricity annually, which can be supplied to about 72,000 households. It is also expected to reduce 111,000 tons of carbon dioxide emissions. The wind power complex in Yeonggwang is the country’s first wind farm where farmers can grow crops or vegetables in the land between the wind turbines or use the empty lot for other purposes. A total 409.7 billion won has been spent to build the complex, which will be directly overseen by 45 locally-hired employees. The complex houses 66 local wind power turbines including those of Unison Co., Doosan Heavy Industries & Construction Co., and Daewoo Shipbuilding & Marine Engineering Co.
Korea East-West Power plans to increase the number of domestic wind power facilities to 200 units by 2030 with hopes to enhance the competitiveness of the country’s wind power industry and contribute to cleaning the air. The completion ceremony on Thursday was attended by about 200 guests including Prime Minister Lee Nak-yon, South Jeolla Province Governor Kim Yung-rok, and Korea East-West Power President Park Il-jun. Park said the completion of the country’s largest 140-megawatt wind farm is in line with the government’s efforts to shift energy policy to one that focuses on renewables and enhances industry competitiveness as domestic materials and parts are used.